Lemgare, in Co Monaghan, where Fintan Traynor was killed seven years ago today. GARDAÍ AND CRIMESTOPPERS have today appealed for information about the death of 20-year-old Fintan Traynor, who was killed when he was stuck by a car on his way home seven years ago. In the early hours of Sunday 26 June 2011, the young man was walking home from a night out. 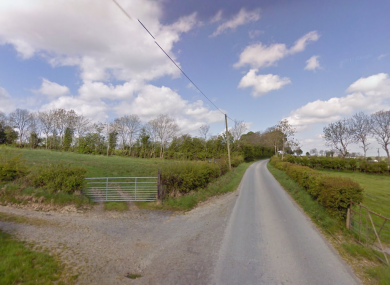 He was on the Lemgare Road, a quiet stretch in the Clontribret area of Co Monaghan, when he was struck by a car and fatally injured. Gardaí have appealed to anyone who was aware of an old model Audi A4 1995 to 2001 missing the front air vent grille around that time to speak to them. Crimestoppers Chairman Tim Dalton said members of the public can call Crimestoppers with potentially valuable information about any crime without leaving their name or personal details. He said the ability to give information anonymously “can be an important incentive and could help solve a case and secure a conviction”. If a member of the public prefers to give the information without identifying themselves, they can call Crimestoppers on 1800 25 00 25. Email “Gardaí seek information about car used in 2011 hit-and-run that killed young Monaghan man”. Feedback on “Gardaí seek information about car used in 2011 hit-and-run that killed young Monaghan man”.